Mr. Ben Smith Jr, son of the late Deacon Ben Smith Sr. and Lila, was born July 7, 1918 in Cameron, SC. At the tender age of 6, he joined St. John Baptist Church. In the year of 1953, he was ordained as a Deacon. After returning from World War II, exercising his faith, he served in many capacities within the church. He was elected President of the Trustee Board, Boardmans of the Baptist Association, Sunday School Union, and Sunday School Convention. Throughout the years he also served as Sunday school teacher, superintendent, 1st male usher board member, and senior choir president. Using his God given gift, he became one of the lead developers constructing the blueprint while building the newly established St. John Baptist church, still standing today. 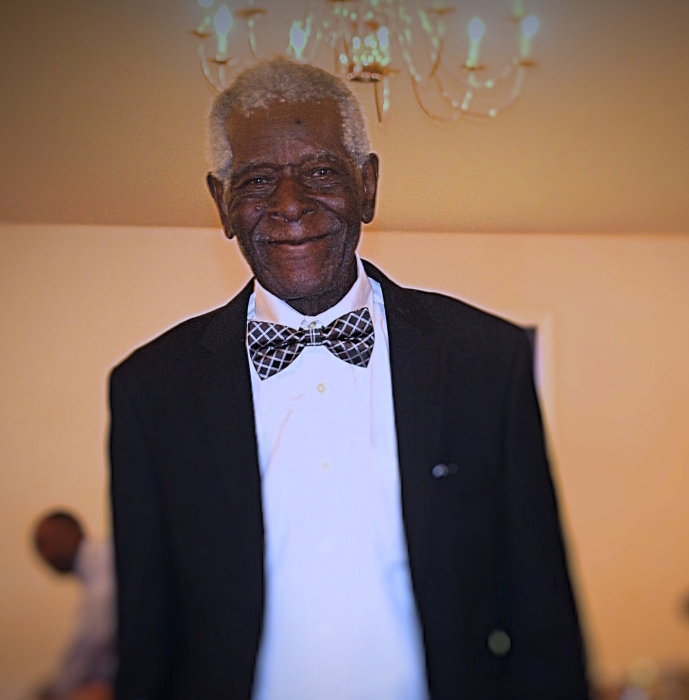 He continued to serve until his health began to fail then he transitioned over to Warren Chapel Baptist Church of Orangeburg, SC closer to home. Continuing his service to community, he joined the brotherhood of the Masonic Temple, reaching one of the highest levels of 33 degree Mason. While serving his country, Mr. Ben was a decorated member of the U.S. Army 25th Infantry Division. During his term, he served as a driver, carpenter, and infantrymen. He held several decorations & citations namely: American Defense SV Medal, American Thea SV Ribbon, American Liberation G023, USAFFE 05 Feb 45, and World War II Victory medal. As an entrepreneur, he was the owner and CEO of Ben Smith Construction company. It was said by many that he was the only man on earth that could draw up plans for a home, dig foundations, do the carpentry, painting, plumbing, electrical, and masonry. With the strength of Samson, Mr. Ben could lay between 1500 to 1800 bricks accurately on a daily basis. Engineering and developing his craft through the years, he mastered all 5 areas of construction with carpentry and masonry among his specialties. It is noteworthy to mention that many masons residing in the Orangeburg area where mentored under his tutelage. To name a few, the late “Charlie Boy Aiken,” the late “Mickey Wannamaker,” the late “Waterboro Paine,” and many others who went on to launch their own construction businesses. It goes without saying that Mr. Ben Smith Jr. paved the way throughout South Carolina in the field of construction for over 45 years. He was a pioneer and trailblazer of the 21st Century. During his Centennial Celebration of Life ceremony, he received a proclamation from the City of Orangeburg Mayor’s office and resolutions from Office of the County Council, and United States Congressman Jim Clyburn, SC. In 2018, he was honored to be one of the Grand Marshalls for the Veterans Day parade. On Tuesday morning around 6:35 am, the “Morning Train” he always sung about stopped by the Lexington Hospital, Room 898 for his departure. With boldness and bravery, he stepped aboard. Daddy squeezed all of the juice out of the orange and turned around and ate the rind. He lived up to his full potential. He experienced everything that life had to offer. The dash between zero to 100 years, 5 months, and 29 days was spiritual, with trials and tribulations, and full of fun. He is survived by his children: son: Marshall (Irish) Smith, Sr. special nephew of the home: Earl Smith both of Orangeburg, SC. Daughters: Mrs. Portia (James) Gillard from Bluffton, SC, Ms. Gladys Starks, Mrs. Ellen (Marion) Ammons, Mrs. Selena (James) Jenkins all of Orangeburg, SC, Ms. Dorotha Brickley, Mrs. Gwendolyn (Mack) Andrews both of West Park, Florida; sisters: Min. Thelma S. Grant of Cameron, SC and Mrs. Rose (Robert) Drew of Washington, SC. Eight sisters-in-laws and four brothers-in-law; a special granddaughter Kyra Smith, and a host of grandchildren, great-grands, and great-great grandchildren, nephews, nieces, cousins, and lovely friends. The viewing will be at Glover's Funeral Home on February 2, 2019 from 2:00pm until 8:00pm. The service will be held at Warren Chapel Baptist Church located at 950 Five Chop Rd in Orangeburg, Soth Carolina on February 3, 2019 at 2:00pm.